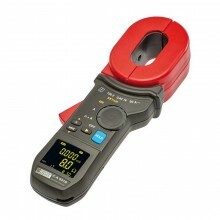 Stakeless earth ground loop and ac leakage current clamp for fast, safe indoor/outdoor earth ground resistance and ac leakage current tests. 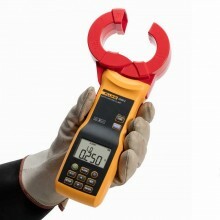 The Fluke 1630-2 (non-FC) Earth Ground Clamp is a hand-held battery-operated clamp that measures the ground resistance of a ground rod without using auxiliary ground rods. 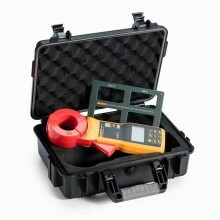 The Fluke 1630-2 can be used in multi-grounded systems without disconnecting the ground under test. The compact and rugged design makes the Fluke 1630-2 easy to use in small places and harsh environments, while the “Display-Hold” and the continuity testing with an audible alarm function, ensures convenience in use. 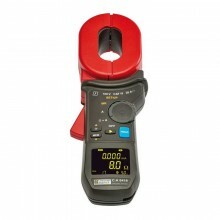 The novel technique means that earth ground loop testing and continuity testing can be completed without breaking the circuit. 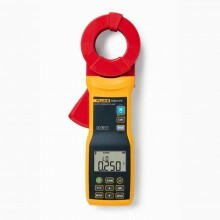 The Fluke 1630-2 uses the Stakeless testing method, which eliminates the need to disconnect parallel ground rods and find suitable locations for placing auxiliary ground stakes. 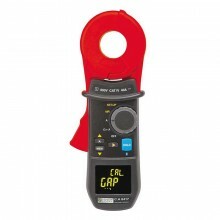 This saves time and enables users such as industrial and utility electricians, and field service electricians and contractors, to perform earth ground loop tests in locations where it is not possible to use other techniques, such as inside buildings or on power pylons. 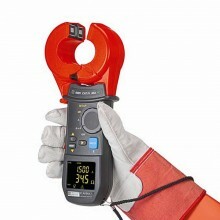 AC Leakage Current Measurement - Identify ac leakage currents without disconnecting the earth ground stake from the grounding system. 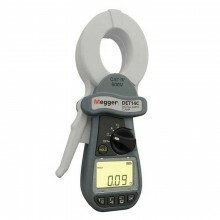 Rugged - Heavy-duty clamp jaw stays in alignment and in calibration even in every day, on-the-job industrial environments. 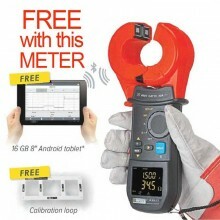 Alarm Threshold - User-defined high/low alarm limits, for rapid measurement evaluation. 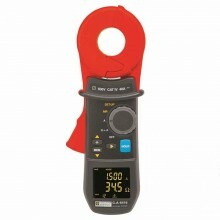 Band-Pass Filter - Selectable band-pass filter function removes unwanted noise from the ac leakage current measurement. Conductor size: 40 mm (1.57 in) approximately. 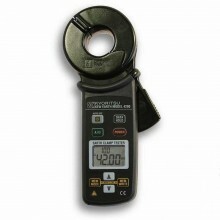 Maximum voltage to earth ground: 1000 V.
Frequency range: 40 Hz to 1 kHz. Ingress protection: IEC/EN 60529: IP30 with jaw closed. 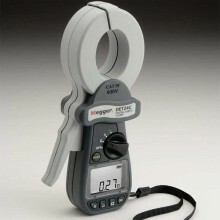 Operating temperature: -10 °C to +50 °C (14 °F to +122 °F). 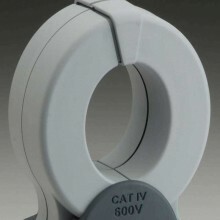 Resistance ranges: 0.025 to 0.249Ω, 0.250 to 0.999Ω, 1.000 to 9.999Ω, 10.00 to 49.99Ω, 50.00 to 99.99Ω, 100.0 to 199.9Ω, 200.0 to 399.9Ω, 400 to 599Ω, 600 to 1500Ω. 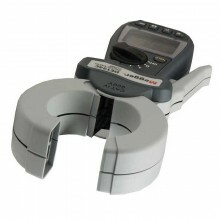 LCD Digital reading: 9999 counts. Record and store measured values. 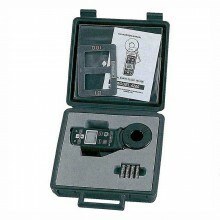 Battery type: 4 x 1.5 V AA alkaline IEC/EN LR6. Battery life: More than 15 hours (backlight and RF mode turned off). Dimensions (L x W x H): 283 mm x 105 mm x 48 mm (11.1 in x 4.1 in x 1.9 in). 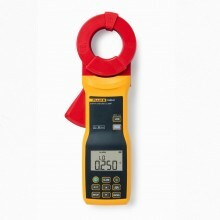 Fluke 1630-2 (non-FC) Warranty: One year. 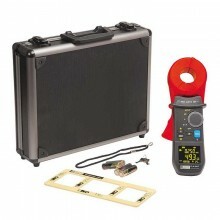 Includes: Fluke 1630-2 Earth Ground clamp, Hard case, Loop resistance standard, 4 AA batteries, Safety information guide, Quick reference guide.